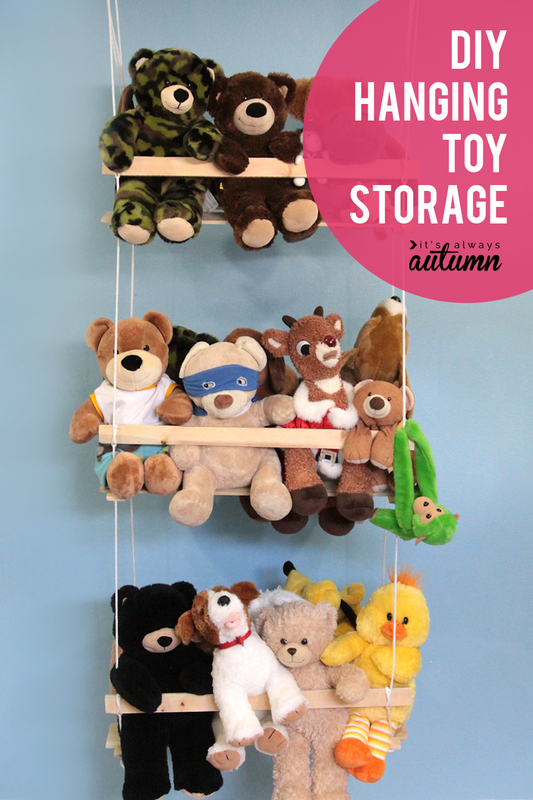 In today’s post: Get all those stuffed animals organized with this easy DIY hanging toy storage system. Anyone else drowning in toys? We really don’t buy the kids that many toys, but they receive them as gifts and inherit them from cousins and save up their own money to buy special ones…and we’ve ended up with SO MANY STUFFED ANIMALS! And of course each stuffed animal is absolutely loved and cherished so it’s pretty hard to convince the kids we should donate some of them. The kids claim they’ll keep them cleaned up on their beds, but it just doesn’t happen, and I’m about to lose my mind. Or I was. 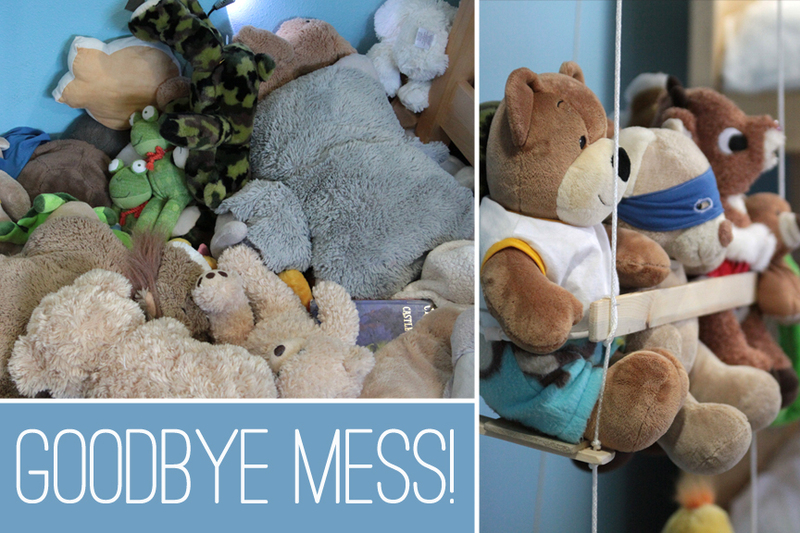 I spent some time hunting for a good stuffed animal storage system. I’ve seen hammocks which hang in a corner of the room (won’t work because there’s no free corner in their bedroom) and large custom built stuffed animal zoos ($200+) and bookshelves with dowels running down the front so kids can stuff all their toys inside (it keeps them off the ground, but looks almost just as messy). I finally came up with a DIY stuffed animal storage solution that is pretty inexpensive and can be easily put together in an hour or two. It’s simple enough that the kids can help with most of the construction. Now, I probably wouldn’t put one of these in a toddler’s bedroom since the temptation to climb on it daily might be too much to resist. But my boys are older – they’re in that stage where they don’t actually play with stuffed animals much, but they aren’t ready to give them up. 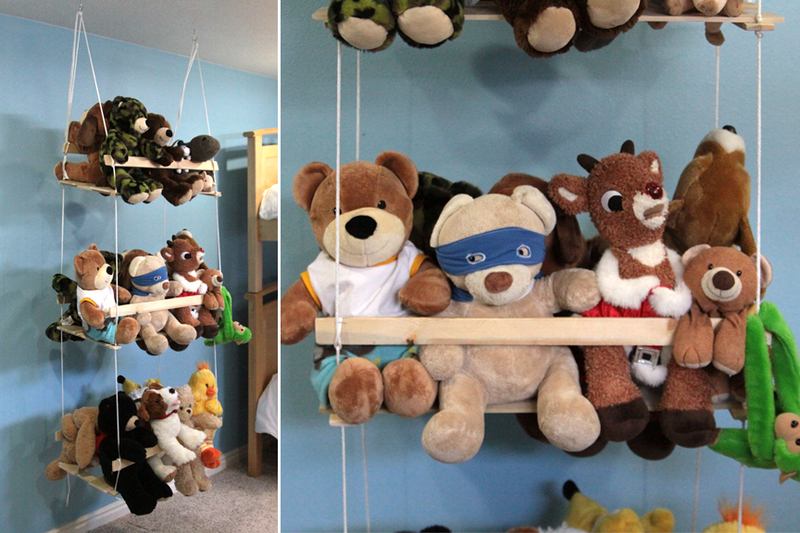 So for them, the stuffed animal swing works perfectly. Each boy has a shelf, and each shelf fits 8 Build-a-Bear sized animals easily, with room for a few more smaller ones stuffed in. The boys know they can keep as many animals as will fit on their shelf, which is going to make it easy to know when it’s time to de-clutter and donate a few. Before we get to the how-to, I just want to make a note: like anything that hangs from the ceiling with rope or cord, this could be a strangulation hazard if an unattended young child climbs on it. Do not put one of these in the bedroom of a very small child, and use your good judgment when building one for an older child if you have small children in the home – thanks! You’ll need the supplies pictured above, plus wood glue and a drill (a staple gun is optional). 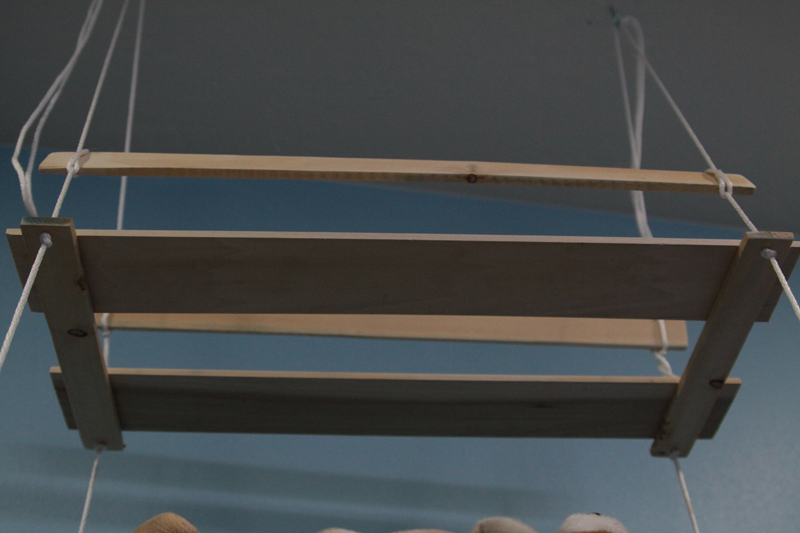 For a tri-level swing, you’ll need six 4in wide by 1/4in thick by 2ft long hobby precuts, about 30 ft of rope, two hooks that can screw into ceiling studs, and 5 4ft wood laths. 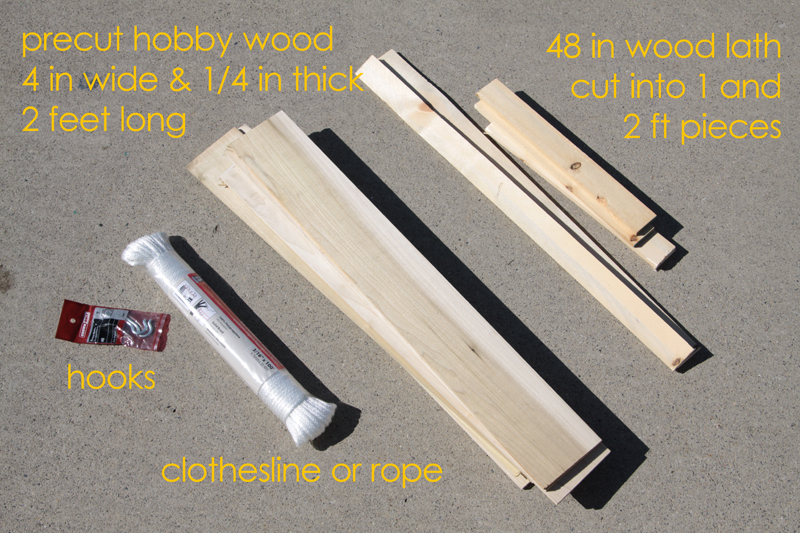 Look for the precut wood in the “hobby wood” section, and wood lath somewhere in the pine boards section at Home Depot. The hobby precuts are a couple of dollar each, and the wood lath is about 50 cents each (pick the lath carefully, looking for ones that are straight and have minimal knots). Start construction by sanding your wood. The hobby precuts will need minimal sanding, but the wood lath will need more. Next, cut your wood lath. For each level you need two 2-ft lengths and two 1-ft lengths. Lay two of the hobby precuts down on the ground with about 2-3 inches between them, as shown below. 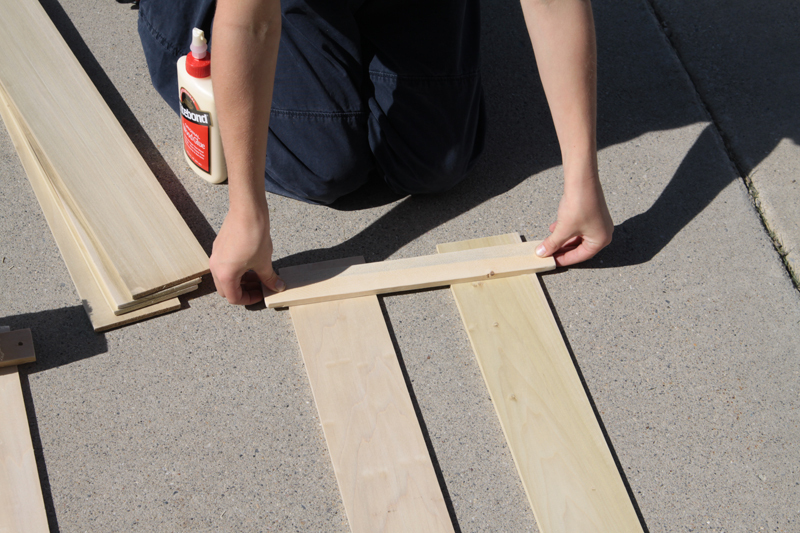 Use wood glue to glue a 1-ft length of lath on each end of the hobby precuts, as you see below. Make sure the lath piece extends a bit off to the side of each precut. Glue together the swing seats for each level (clamp together or lay something heavy on each lath while the glue dries) and let dry completely. Then you’ll drill a hole big enough for your rope to go through on each end of the lath pieces. In the photo above, the hole would go right where the boy’s thumb is on the right. In the photo below you can see how the swing is put together. Cut 4 lengths of rope – 8 feet is probably plenty, but this will depend on how high your ceiling in in the room you want to hang this swing and how low you want it to hang. Put a knot at one end of the rope, then thread it through the swing seat. Place another knot right on top of the swing seat. 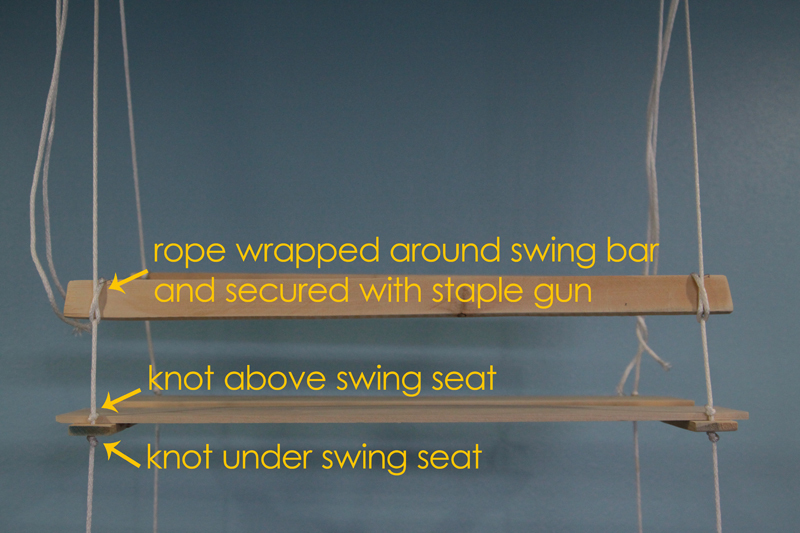 About 4 inches above the swing seat wrap the rope around a 2-ft piece of lath, which acts as the swing bar. Either knot the rope or secure with staples. I have been waiting for this tutorial ever since I seen it on “So You Think You’re Crafty” I have been searching for a stuffed animal storage solution for a long time and nothing seemed… right. I think my daughter will love this!! Thank you! My daughter has so many stuffies and a small room – this has to be the most genius way I’ve seen to store them, awesome! Thanks. So cute! Popped over from handmade tuesdays! Love this! Looks so much better than a “pet net.” Will definitely be making one of these for my son’s room. Thanks for sharing. What an adorable way to keep the toys in one place. It looks like they are having a great time swinging, too! I love this project. My daughter needs one. I’ve also repinned it to the “Small Spaces, Big Impact” pinboard at Pinterest/home depot. Thank you for the inspiration. Dolly, you are welcome to use one photo and a sentence along with a link sending people back to the tutorial – that would be great! Just please don’t quote long sections of the tutorials – thanks! Can you please tell me what brand the tan bear is on the last row?! long or short run ‘ depending on market conditions of course. A common question among investors is “What are the benefits of investing in commercial real estate when compared to other investment options. When you are living in a residential leasehold property you are allowed to exclusively inhabit the property and do with it as you wish, as long as it is within the constraints of the lease agreement. Is anyone not getting the results you expected or don’t know where to start Real Estate Business. For many investors, property investments are personally very rewarding as they allow entrepreneurs help others find homes and properties. On South East PA’s northern border is the Valley Forge National Historic Park as well as the King of Prussia business and trade center with the nation’s biggest center of retail stores. During the contract negotiation phase, the due diligence process is well underway. There are many reasons a homeowner might need to sell quickly. The sale of new homes has dropped drastically around the country and older homes have cooled off in the market, as well. You get to commit only 3 several hours at the fitness center per week and get double the results. etc. Our outfit tells a lot about who we are or who we want to be. Please don’t take this as being rude but wanted to throw the warning out there as to how dangerous this could be for small kids. its a cute idea and all but really think about it.. specially if you have little climbers/dare devils. I personally wouldn’t feel comfortable making one but maybe would work out good for an older child, just not toddlers/preschool age. They could get curious and want to “swing” or climb on it, slip and get hurt or worse get hung on it.. sorry to be down on this but you have to think about your kids safety too and this is not safe. I’ve put a note in the post cautioning people not to make one of these for a small child, and to use caution making one for an older child if there’s a small child in the home – thanks! Hi, this is a great idea, looks fab. I may wait a while though as my daughter is nearly 3 and I imagine her emptying it then trying to climb it – it’s just the phase she’s going through right now. lol. I think, if introduced early enough, then they can be taught not to try to climb it. But at this stage my daughter likes to do the complete opposite of what I ask her lol. Just finished the swing! Thank you for the great idea and tutorial! Brilliant idea! I would never think of that! I wanted to propose to my daughter something like that for her toys for months now, thanks! Very beautiful idea…I m gonna do this as I also don’t have any free corners. Great toy storage, so fun! I am sharing this on Pinterest. I just got to say that after reading your blog 2 weeks ago I made 1 exactly the same for my 5 year old niece. And she absolutely loved it. So I just wanted to come back to tell you this and it was an absolutely success. Messy zone is common problem which home has kids. I am one of them. I have to busy max time to arrange of my kids messy toys. It’s really tough. I am searching how to get rid from messy toys. Thanks for sharing amazing ideas. It’s really helpful for me. Now i am free from my kids huge messy toys. Thanks for helping to buy stuff animal storage solution. Thanks for sharing the idea. its amazing to have a hanging toy storage for your kids. Good article! Thanks for the interesting information! Thanks you for the interesting information! Good article! I am really happy that I read this report. Superb article! It is difficult to discover info. You’ve provided an extremely practical article. Thank you. Very good moment. I am glad to read your article. Details can be found by not resources. Your site is now my favorite at the moment. Hopefully shortly find a larger sum of content. I am interested in improving my schooling, so I try to look for such info. Continue your activities to supply the information they want to people.